What is the electron geometry and molecular geometry for # SCl_2#? The electron geometry is tetrahedral and the molecular geometry is bent. To determine the geometries, you must follow a series of steps. Step 1. Draw the Lewis structure. Step 2. Use VSEPR theory to determine the electron geometry. 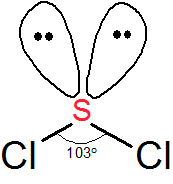 #"SCl"_2# has 2 lone pairs and 2 bonded atoms, for a total of four electron groups. According to VSEPR theory, four electron groups will point towards the corners of a tetrahedron. The electron geometry is tetrahedral. Step 3. Determine the molecular shape. When describing the shape of a molecule, we ignore the lone pairs and look only at the bonds. The two #"S-Cl"# bonds are bent at an angle, so the molecular geometry is bent.